Moms work hard and sometimes a couple of hours at the spa or, a fun night out with the girls, just isn’t enough to rejuvenate. Give that special do-everything lady a real treat with a weekend away from home. There are some great nearby getaways and retreats that will have mom feeling like a million bucks and ready to return home to her tribe full of energy. Book these great stays now, and show mom how much you really love her! Read on to find out more. Just a quick two-hour drive away, Astoria has everything mom has been dreaming of. With easy access to the Columbia River and Oregon Coast beaches; a multitude of museum and heritage sites; and endless number of hiking trails and outdoor activities—mom will have plenty to do. A climb to the top of the Astoria Column—600 feet above sea level— will give her a nice little adrenaline rush and a beautiful view of Young’s Bay, the Coast Range, the Columbia River and the Pacific Ocean. Or, she can really get her blood pumping with a zip-line adventure with High Life Adventures! Have her bring a friend and they can kill a whole day soaring through trees. Downtown Astoria is adorable and filled with shops that mom is sure to enjoy perusing. After a day of browsing local goods, she’s sure to have worked up an appetite. Mom can grab a bite at the Fort George Brewery where any Portlander will feel right at home with their selection of craft beers, pub food and pizzas. Or, she can hop over to T. Paul’s Urban Cafe for some fine seafood dining and dessert. Book mom a stay at the Best Western Astoria Bayfront Hotel where she will enjoy a spacious room, access to a pool and hot tub and a free full breakfast each morning. What a bonus! If you want to make mom feel really loved, suprise her with a 90 minute relaxation massage for $110 at Malama Day Spa. She is sure to return home with an extra big smile after this amazing treatment. Give mom an opportunity to spend a weekend meditating, getting her yoga on, writing and getting in touch with her artistic side along with a group of women who know exactly how she feels: other moms. This retreat is nestled in the Central Oregon Cascades at the serene Suttle Lake Camp. It is specifically designed for mothers looking to relax and connect with others. Unlike many retreats, this one is all-inclusive, so for one reasonable payment of between $350 -$400 (depending on choice of accommodation) mom gets to enjoy all of the workshops led by professionals, chef-prepared organic meals and family-style lodging. Along with workshops, yoga and meditation; mom will have the opportunity to join guided hikes and enjoy a free session with visiting practitioners. Some of the treatments she can choose from include massage, reiki and intuitive counseling. The Sacred Mother Retreat is held twice a year. Once in June and again in October. There is nothing quite like a weekend stay at a cabin in the woods. Mt. 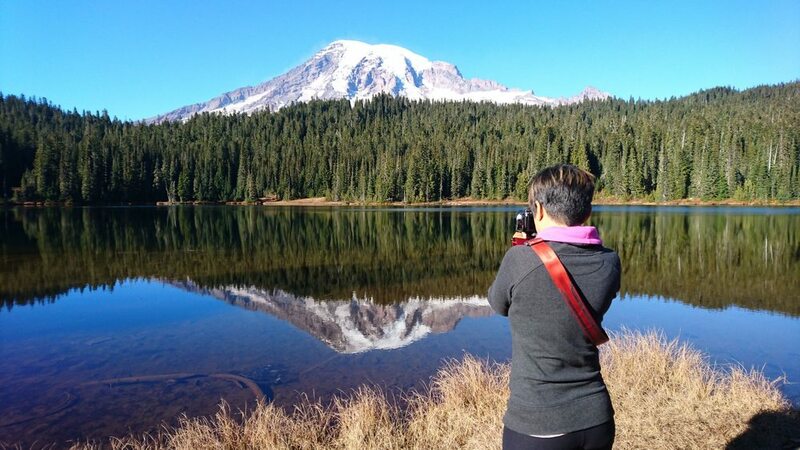 Rainier is the perfect place to send mom. With the National Park open year-round, she can get in all of the outdoor adventures she’s been dreaming of. If she’s been wanting to snow shoe, the higher levels don’t melt until well into summer and there are plenty of lowland hikes that will take her through towering trees, along babbling rivers and streams, and by crystalline waterfalls. Book her a ride on tram at Northwest Trek and she may even get an opportunity to meet wildlife up close and in person! Or book her a ride for only $41 on the Mt. Rainier Railroad where she will see the wilderness area from a truly unique perspective all while relaxing in style. While hotels are nice, there’s nothing like a night or two in a luxury cabin. Three Bears Lodge has eight cabins available. All have hot tubs, fire pits, and wood stoves for mom to enjoy. She’ll love spending her evening soaking under the stars with a glass of wine in her hand. Be warned…she may never want to come home. Just a three hour drive from Portland, Seabrook is a small town on the Washington coast that offers mom a dream retreat from the from the demands of daily life. Book her a luxury cottage through Seabrook Cottage Rentals. There are a variety of options available, some with fireplaces for mom to cozy up next to with good read and some with hot tubs perfect for soaking under the stars in. That special lady in your life will love strolling around this idealistic little town where her car will go unused for the entirety of her stay. She can rent a bike from Bucks Bike if she wants to get around faster than on foot, but for the most part, everything she wants or needs is a quick walk away including the stunning coast line and great dining options like Front Street Market and Frontager’s Pizza Co. And mom will love grabbing a sip at Stowaway Wine and Cheese Bar. If you want to make sure your favorite lady feels extra special and returns to you at her best, make sure to book a massage at Spa Elizabeth where she will receive unparalleled service. Give her a beach giveaway she will never forget. After all, she deserves it. Parenting > Mom Hacks > Retreat and Recharge: Mom Weekend Getaways to Book Now!